For over 25 years, we have been constructing lasting life insurance plans that work to provide assurance to our clients when they need it most. Since life Insurance is a financial instrument that makes a projection today of what may happen 30 or more years in the future, we take a careful, purposeful approach to designing each plan based on your unique needs and servicing those plans to ensure they remain on track. We call our approach Life Assurance 360. 1. STRENGTH: We believe choosing a financially sound company is fundamental to creating a sound life insurance plan and is the equivalent of laying a foundation of a physical structure. 2. PURPOSE: Today’s life insurance products are complex and require a high degree of expertise to customize in order to find the exact combination that suits your particular purpose for coverage. 3. UNITY: Since underwriting can have the single greatest impact on policy pricing, we have a professionally managed, confidential advocacy process to unify plan design with medical underwriting to assist in achieving the best value for you. 4. ASSURANCE: Creating a plan that combines financially sound companies, purposeful design, and underwriting advocacy is a great first step, but if it is not maintained over time, it may be just as prone to failure as if nothing had been done at all. 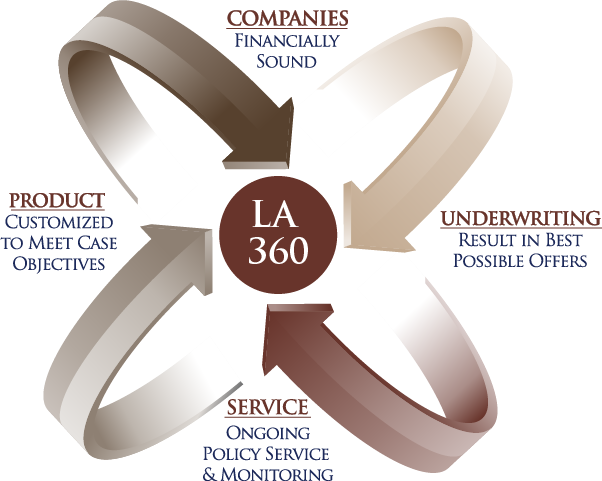 That is why we utilize the LA 360 software that manages and reports on the performance of your policy to assist in ensuring that it remains on track. Each step of this process, addressed in isolation, may yield results that fall short of those produced when all four are working in concert. This is why we believe that it is our duty to take a 360°, comprehensive approach to life insurance. Hence the name of our process is Life Assurance 360™.